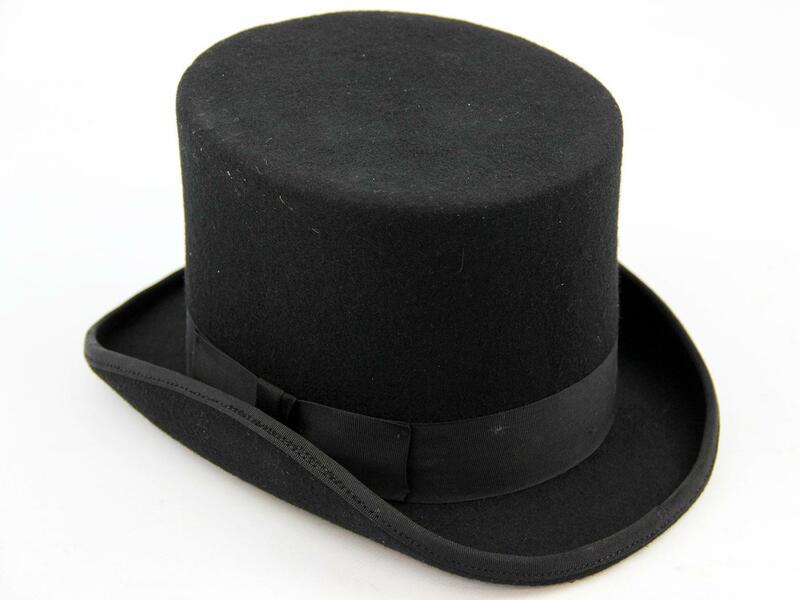 'TOPPER' MENS RETRO SMART DRESS VINTAGE WOOL TOP HAT (Black). Stove-Pipe, Chimney Pot, High Hat or most commonly the Top Hat! Most recognisable from smart dress occasions. A predominant form of headwear during the 18th and 19th Centuries, it's time to bring this Retro classic back. Beau Brummel Dandy-ism, inspired by the Incroyables, this Vintage classic is due a renaissance - The Topper Top Hat. Topper - Mens Retro wool top hat in classic black with Vintage style broad brim and traditional flat crown. Typical chimney pot shape adds to the authenticity and the article is expertly finished with exquisite tonal ribbon band. White lining and protective headband to interior. Mens Smart Dress Retro Top Hat. James Laver, renowned fashion historian and curator of the V&A museum between 1938 and 1959 observed an assemblage of Top Hats resembled rows of factory chimneys and added to the mood of the industrial era. I'm puttin' on my top hat, Tyin' up my white tie, Brushin' off my tails (Lyrics from the song written by Irving Berlin for 1935's 'Top Hat' starring Fred Astaire and Ginger Rogers). 'TOPPER' MENS RETRO SMART DRESS VINTAGE WOOL TOP HAT. Colour: Black. SKU: Top - Mens Top Hat. 'Topper' Mens Retro Smart Dress Wool Top Hat (Black).